INTRODUCTION TO ENGINEERING DESIGN IS THE FIRST OF THE FOUR PLTW ENGINEERING CLASSES. IT IS MOSTLY ABOUT THE DESIGN PROCESS AND METHODS OF COMMUNICATING DESIGN. STUDENTS WILL LEARN THE BASICS OF AUTODESK INVENTOR (A MECHANICAL MODELING PROGRAM) AND PRACTICE CREATING FILES LIKE THE ONE SHOWN ABOVE. 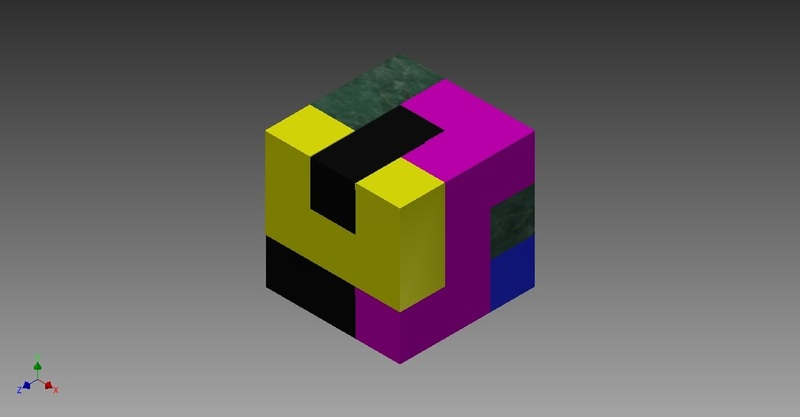 ANOTHER EXAMPLE IS THE PUZZLE CUBE SHOWN BELOW. IN THE PUZZLE CUBE PROJECT, THE STUDENT WILL CREATE MULTIPLE DESIGNS, SELECT THE BEST ONE, THEN CREATE AND TEST A PROTOTYPE. STUDENTS WILL ALSO LEARN THE BASICS OF DRAFTING WITH ORTHOGONAL PROJECTION, DIMENSIONING AND ISOMETRIC PROJECTION. MEASUREMENT, STATISTICS, UNIT CONVERSIONS, AND SOME BASIC GEOMETRY ARE STUDIED.